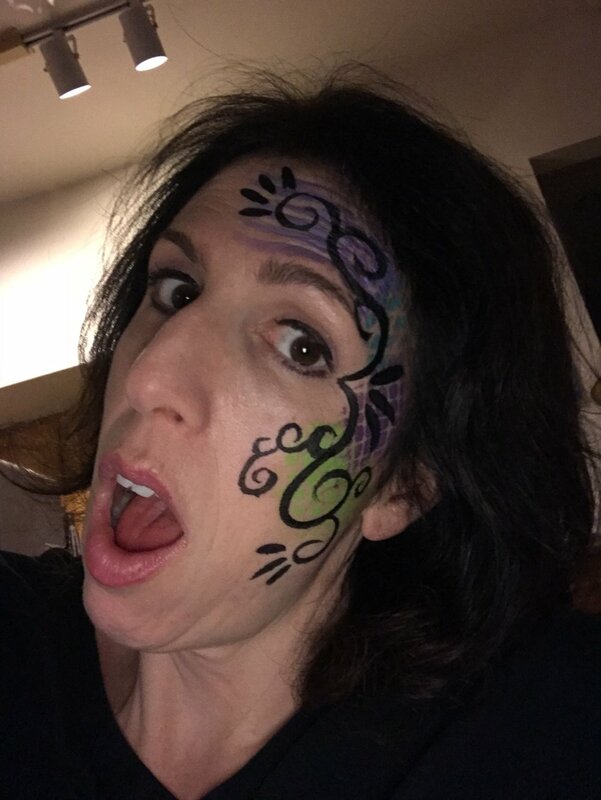 The last time I had my face painted was last year for the 6th anniversary of my storytelling show, Yum’s the Word. I completely art directed what I wanted. A simple purple (my signature color) ice cream cone. Nothing too crazy. Having worked in advertising for the past decade as a Creative Director and Copywriter, I’ve learned that perfection rules the day. As the daughter of an English teacher who was a stickler for grammar, punctuation, spelling and perfect attendance (impossible given that we were Jewish and got dinged for one of the High Holidays), I fit right in. Generally speaking, it’s hard for me to do things half-assed. I notice all mistakes and imperfections, but more importantly, I care a lot (sometimes too much). No matter how many times my former boss Gary Vaynerchuk tells me, “Document. Don’t Create”, I struggle. Perfectionism is in my DNA. Little by little, I’ve learned to let some of it go. However, when it comes to decorating my face, I’m not much of a risk-taker, but on this night, I decide to go for it. I enter my friend’s party and am instantly struck by something I normally don’t see at an adult’s party. Face painting. More than half of the guests’ faces are painted with elaborate designs. I tell the face painter that I want something simple and subtle with a little bit of purple. The rest is up to her. She seems downright giddy probably because a Type A New Yorker is not giving her prescriptive notes on something seemingly arbitrary. I feel her paintbrush sweep across my forehead and I’m confused. I thought we were just focusing on the cheekbone. I resist the urge to say something. Then, I feel a curlicue go down my face and I imagine that my cheek has been transformed into a Jackson Pollock painting. I want to ask her what she’s doing, but I remain friendly and agreeable. Then she, hands me a mirror. I look at my reflection and I’m dumb-founded. Nothing about this is simple and subtle. I look like a cross between the Phantom of the Opera and Mike Tyson. I want to do an Irish good-bye, but I can’t. Instead, I return to my friends. I know they’re being nice. It’s sooooo not me. A little bit later, I see the woman who was waiting in line behind me. She had told me she was getting something simple and subtle and lo and behold, she did…. on her cheek. At first I’m envious, but ultimately, I know it doesn’t matter. At least I tried to adopt my BTL mantra even if it backfired on me. And when I get home, I let that design go… right down the drain. Are you a perfectionist? Overthinker? Type A? You’re in good company. Tell me how you handle it in the comments below. Eat your heart out (not your ear), Mike Tyson.